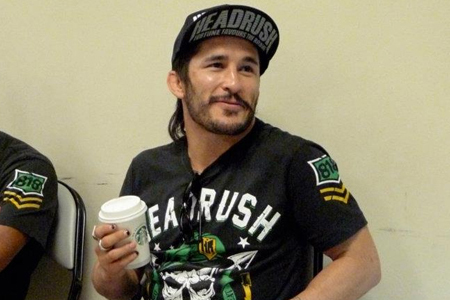 With only 16 days remaining until the curtain is drawn on “UFC on FOX: Shogun vs. Vera,” and just six weeks removed from his defeat to Demetrious Johnson, Ian McCall (Pictured) has agreed to face John Moraga when the Octagon returns to primetime television. After posting a disappointing unanimous decision loss to Johnson in the flyweight tournament semifinals, McCall vowed to make a quick turnaround and perform in the August 4th show. Despite his unusual nickname, “Uncle Creepy” managed to keep his promise. Moraga makes his big league debut riding a four-fight winning streak. He trains in Arizona under the tutelage of reigning UFC lightweight champ Benson Henderson at MMA Lab. McCall vs. Moraga will appear in the event’s preliminary card, although it’s unknown whether the scrap will be made available on Facebook or FUEL TV. Staples Center in Los Angeles hosts the shindig.